It weaves through rush hour traffic, blinding anyone in its path. It's a moving distraction, catching drivers' eyes in their peripheral vision and stealing their focus. It markets to you against your will. No one knows what's inside it.What is this mysterious vehicle, you ask? 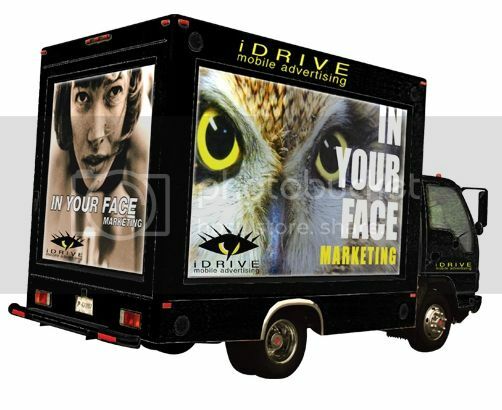 As if we weren't advertised to enough on a daily basis, the advertising truck forces itself upon you simply by existing in your space. It tries to act all nonchalant, like, "don't mind me, I'm just a truck…going places and doing things like trucks do…" but it couldn't be more obnoxious. I'm personally offended when I'm just trying to drive home from work and this scrolling neon sign is glaring at me directly in front of my face. And let me just add that this obnoxiousness increases by approximately 65 percent when it starts getting dark at 4:30 p.m. By the time I'm driving home from work, this beacon of capitalism's stark contrast to the surrounding blackness is dangerous at best. Seriously, it was all I could do not to slip into a trance in its lime green glow instead of focusing on the road in front of me while I passed it in the other lane. But the thing I hate the most about these advertising trucks is--I have no idea what their function is. I mean, what are they carrying? And to where? Are they actually going anywhere at all? Or are they just driving around aimlessly so that people see the ads? I've spent a good portion of my life pondering these questions and have come up short every time. I can't find any language on the truck itself that indicates what the truck does other than show people blindingly bright (and scrolling, I might add) advertisements while they're trying to safely transport themselves to the grocery store and back. I even caught a glimpse behind the scrolly-vinyl-ad-paper-stuff when I was sitting next to one at a red light the other day, but saw nothing. Just nondescript white nothingness. I tried to investigate further, but that was when I realized I was no longer watching the road and that these things are definitely a menace to society. I mean, I get it. We live in the good ol' U.S. of A., and we get advertised to. A LOT. Behind the window in which I'm writing this post, I am staring at three different ads on CNN's site. All of them are orange. But come on. Do these trucks seriously only serve to advertise? That seems like a serious waste of space. I feel like if the rest of the world knew about these trucks, we'd be toast. I'm an American (now), and even I think that's excessive. Have you ever seen these trucks? Do you know if they DO anything?